Though its name might indicate otherwise, SMK-Link Electronics’s PadDock 10 does quite a bit more than simply dock your iPad. The California-based company’s iPad charge-and-sync station turns your device into a veritable entertainment system, complete with rotatable mount, charge and sync capabilities, and stereo sound system. Boasting a small footprint and Apple-esque design aesthetic, The PadDock 10 cradles your iPad in its sturdy frame, keeping the tablet charged and synced with its own USB cable. While docked, you can tilt or rotate your iPad 360-degrees for optimal viewing angle, and when it’s time to get your move on, the iPad easily snaps in and out of the PadDock 10’s cradle. Best of all, the PadDock 10 sports a finely tuned stereo sound system with custom designed 40mm x 50mm speakers with neodymium magnets, turning your iPad into more of a home entertainment system than you might have thought possible. With a $100 price tag, the PadDock 10 might be a bit of a commitment for the casual user, but for the serious at-home iPad user, it could prove to be a winner. 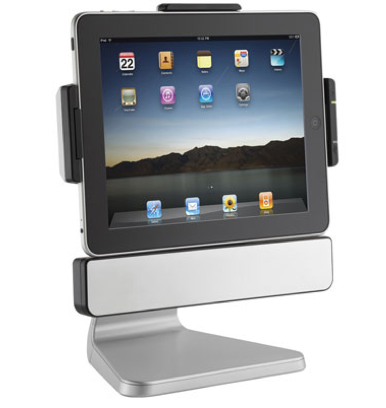 The Mac-matching PadDock 10, a combination iPad stand and speaker system, holds your iPad snugly. The speaker won't impress, but the stand does a great job of angling your iPad well.